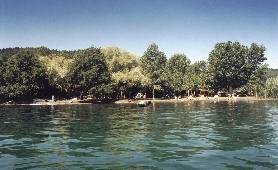 Directly on the shores of Lake Bracciano, immersed in the green of century-old olives, Camping Azzurro offers to its guests all confort for a pleasant stay. The camping ground is 23.000 m² of grassplot, in part terrace ground in part level ground and it has a wonderful sandy beach. Spacious and well shaded pitchs with electricty and drinkable water provide relax and total freedom to our guests. Ideal stay for who wants to pass from one of the most green zone of Italy to ancient Rome splendors, to its monuments and its Churchs, at only 50 minutes of train. Archeology lovers will find daily routes to discover our ancients visiting Cereveteri, Vulci, Tuscania and Tarquinia. 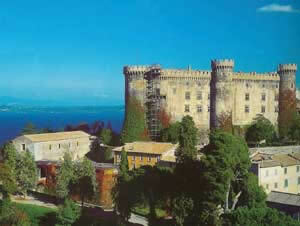 Don't miss the majestic Odescalchi Castle in Bracciano!